I’m not really that into resolutions. I think they are kind of silly, actually. That’s why I started my new exercise plan on December 28th — so much less pressure! I’ve been pretty good, only skipped two days in the last 9. January 1st because I was just too hung over to jump around with Jillian Michaels and January 2nd because it was my last day of vacation and I really wanted to finish Harry Potter and the Order of the Phoenix. 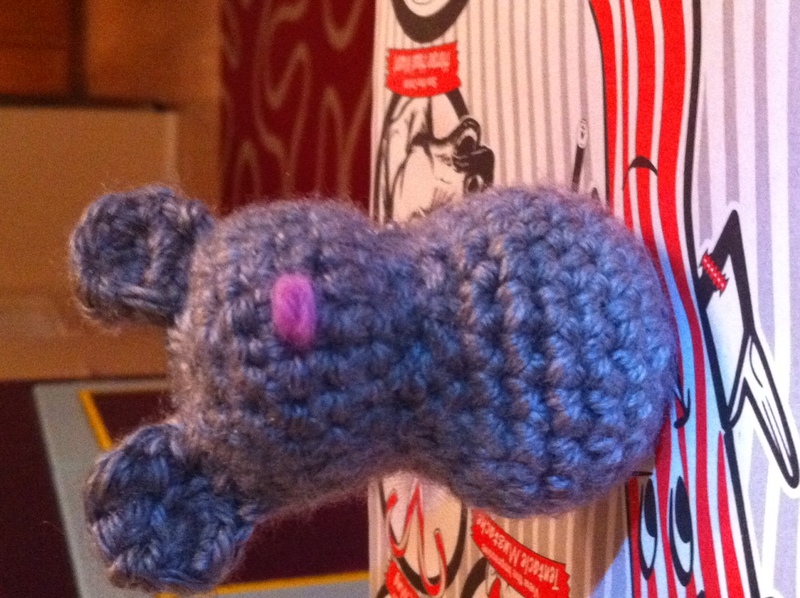 I am also not resolving to make anything in particular this year. I’d like to keep up with the crochet because I enjoy it. 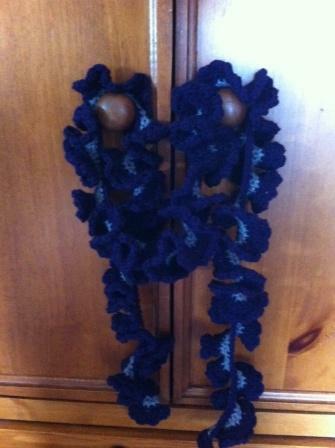 Here’s a picture of the scarf I made for my mom for Christmas. 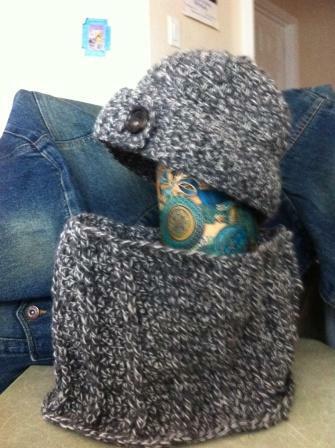 The pattern is from Red Heart, but I added a little scallop detail along the edge. 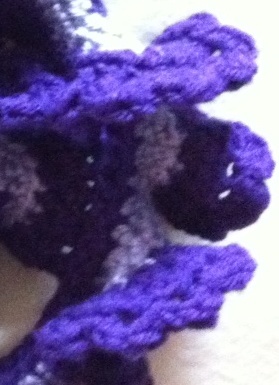 The stitch is three double crochet in the same stitch followed by a slip stitch in the next stitch. The colors are actually a true dark purple and pretty dove gray. The important part is that I think she really liked it. I made a similar scarf for a friend in purple and turquoise. I am working my way through The Order of the Phoenix right now. We read the first three books aloud a few years ago when M was younger. Then homework became a nightly ordeal and we didn’t have time for Harry. I’m glad to finally be reading the books. I generally prefer to read a book before I see the movie, because I find the director’s vision colors my reading too much. But even if I hadn’t seen the HP movies (all but the last one, so please don’t spoil it), the imagery is so ubiquitous that my vision would be influenced by the movies. I’ll be posting everything I read this year. 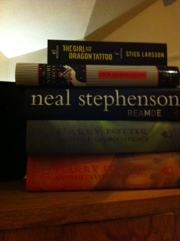 I am an avid reader and literally (no pun intended) a stack of books nearly a foot high waiting for my attention. My project this week: completely overhauling my 10 year-old daughter’s room. The challenges are vast. She is a borderline hoarder and keeps every item she has ever touched. I’m not kidding. I had to bribe her to get rid of Valentine’s cards from first grade. She loves stuffed animals more than she loves life and owns hundreds. I’m trying to come up with a way to pare down the stuffed friends without devastating her. It is not going to be easy. We made tons of progress yesterday — the closet shelves have been cleared and are ready to be filled back up with stuff she needs. We filled six bags with trash and four for Goodwill. We bought new curtains that will cover the west-facing arch-top window and hopefully help cool her room down in the summer. I’ll post pictures when it is done! About a year ago I decided to try my hand at making jewelry. I’ve made a few things: a couple of necklaces, a few pairs of earrings. But mostly I’ve purchased supplies. See, making jewelry requires a lot of stuff. Which can be expensive. So it’s taken me a long time to accumulate enough stuff to put together the look I want. I’m mixing vintage and new, hoping to come up with something a little steampunk-ish, a little vintage inspired, but also wearable in the professional world. I made two pairs of earrings in the last two days. The first was a gift for a friend . The beads are vintaqge pressed glass with a pink opalescent hue. 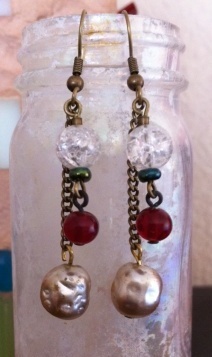 The second pair have vintage glass pearls and red glass drops. They don’t have a home yet, although I may send them to my boss as a thank you for the personalized notebooks she sent me.